Hannah Hamilton replants tomatoes at Buckle Farm in Unity, May 9, 2016. Right now, the lush fields at the farm he and his fiancee Hannah Rose Hamilton run are awash in ripening organic produce, including tomatoes, onions, cantaloupe, lettuce mixes, baby turnips, carrots, beets, mixed herbs and potatoes. But there’s a big problem: Usually, the couple would be working alongside three farmhands this time of year. Now, they are down to just one. Buckle and Hamilton are far from alone in Maine, where many farmers are struggling to find enough workers to pick their harvest and get it to market. The farmhand shortage is affecting farmers who specialize in produce and those who work mostly with livestock. The Maine Organic Farmers and Gardeners Association and the University of Maine Cooperative Extension will hold an emergency listening session on Thursday, Aug. 30, to hear more from farmers about how the labor shortage is affecting them and learn more about what they could do to help. So what does this mean for Maine, a state whose recent agricultural renaissance has been held up as an example for other states that want to grow their own farming economy? And why is it happening here? The labor shortage on Maine farms is part of a national phenomenon affecting many industries, experts say. A very low unemployment rate and a tight labor market has meant that many industries, including the construction and hospitality industries, are are experiencing difficulty finding and keeping qualified workers. In Maine, the seasonally adjusted unemployment rate for July was just 3 percent, according to the Maine Department of Labor. That’s close to the lowest it has been in 40 years. Workers can afford to pick and choose what they want to do. For Maine farmers, who mostly need help with seasonal manual labor in often challenging conditions, that has meant finding good farmworkers in some cases has been nearly impossible. There seem to be fewer people who are willing and able to do the work, and those who are may ask for wages that are high enough to cut into a farm’s profitability. That can be a problem in of itself. 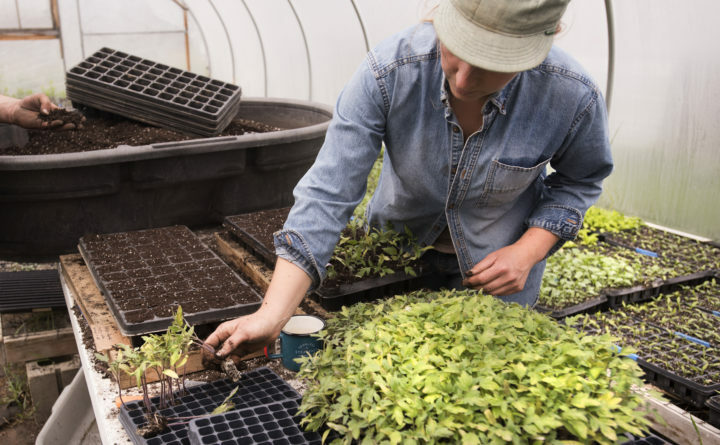 “This labor shortage is concerning, as farming is all about timing, and when crops need to be harvested, farmers need to be able to rely on the labor being there to make it happen,” Amanda Beal, the president of the Belfast-based Maine Farmland Trust, said this week. Ryan Dennett, the New Farmer Programs coordinator at MOFGA, said the booming national economy seems to be dovetailing with a declining interest in the association’s farm apprentice program, which has long been a way for curious, would-be farmers to exchange their labor for room, board and experience working on established farms. Back in 2013, 120 host farms participated in the program, and more than 300 people submitted apprentice applications. This summer there were just 40 participating farms and just 81 applicants for the apprenticeships. The growing national economy may not be the entire explanation for the shrinking apprenticeship program, she said. As farms mature, farmers may find they need a different type of worker than the apprentice program can provide. But one farmer who has relied on the apprentice program is Caitlin Hunter, owner of Appleton Creamery. She said this is the first year in 15 years that she has not had a single MOFGA apprentice to learn about cheesemaking and to help her milk and care for the 60-plus goats that live on her busy, productive farm. She does have one hourly helper who works eight hours a day, five days a week, but it’s not enough, Hunter said. At the Buckle Farm, Buckle does not mince words to discuss some of the reasons why he thinks the shortage is happening, and what he and Hamilton will have to do to cope with it going forward. There’s also a shortage of affordable housing in midcoast Maine and a lack of local interest in working on the farm. But taken together, what all that means is that business as usual isn’t possible anymore. Buckle, who got into farming because he wanted to feed his community, said that they will have to pull the plug on the community supported agriculture program, or farm share, they offer to their neighbors. Instead, the couple is planning to streamline what they grow down to just six vegetable items, which they will then sell to wholesalers. “It’ll make our life a lot easier, but it’s not what we want to do,” he said. And that means that although the sky may be blue and the sun may be shining on Maine farms, there’s a lot of gloom right now for Maine farmers. Still, all hope is not lost, according to folks like Dennett and Buckle. Buckle puts it a little more bluntly.